(Courtesy of Michigan DNR) – The Michigan Department of Natural Resources today announced the final totals from its spring fish-stocking efforts. The DNR’s Fisheries Division stocked a total of 19,382,390 fish that weighed 383 tons and consisted of 10 different species and one hybrid. To complete this task, it took nearly 400 stocking trips to 739 stocking sites, with drivers traveling more than 100,000 miles over the course of 2,168 hours, using 17 specialized stocking trucks. Marquette State Fish Hatchery (near Marquette) stocked 603,381 yearling lake trout, brook trout and splake (a cross of lake trout and brook trout) that in total weighed 60,340 pounds. This hatchery stocked a total of 103 inland and Great Lakes sites using 62 trips that required driving 17,684 miles over 438 hours. Thompson State Fish Hatchery (near Manistique) stocked 7,784,768 fish that included walleye fry, yearling steelhead and brown trout, and spring fingerling Chinook salmon. These fish weighed 125,263 pounds in total. This hatchery stocked 89 sites (the majority located on the Great Lakes) using 65 trips that required driving 16,072 miles over 416 hours. Oden State Fish Hatchery (near Petoskey) stocked 638,498 yearling brown trout and rainbow trout that in total weighed 120,470 pounds. This hatchery stocked 143 inland and Great Lakes sites using 74 trips that required driving 21,296 miles over 545 hours. Harrietta State Fish Hatchery (in Harrietta) stocked 1,097,050 yearling brown trout and rainbow trout that in total weighed 112,512 pounds. This hatchery stocked 301 sites (the majority located inland) using 96 trips that required driving 27,056 miles over 676 hours. Platte River State Fish Hatchery (near Honor) stocked 2,518,933 fish that included yearling Atlantic salmon and coho salmon, and spring fingerling Chinook salmon that in total weighed 107,299 pounds. This hatchery stocked 36 sites (the majority located on the Great Lakes) using 36 trips that required driving 7,781 miles over 186 hours. 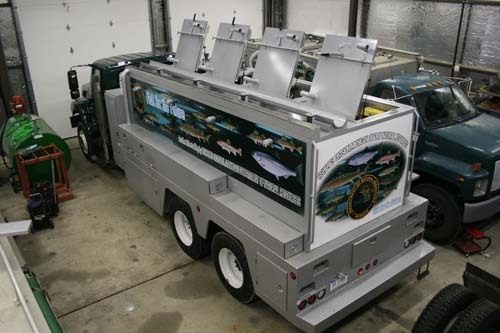 Wolf Lake State Fish Hatchery (near Kalamazoo) stocked 4,536,703 fish that included walleye fry, yearling steelhead, and spring fingerling Chinook salmon that in total weighed 111,014 pounds. This hatchery stocked 67 sites (the majority located on the Great Lakes) using 52 trips that required driving 14,020 miles over 324 hours. The cooperative teaching hatchery at Lake Superior State University (in Sault Saint Marie) stocked 40,954 Atlantic salmon weighing 5,795 pounds into the St. Marys River. In addition, Wolf Lake, Platte River and Thompson state fish hatcheries transferred millions of walleye fry to management unit rearing ponds for grow-out and eventual stocking this summer and fall. Several management units also stocked and transferred many species of cool- and warm-water fish within their units. Fish are reared in Michigan’s state fish hatcheries anywhere from one month to one and a half years before they are stocked. It should be noted that some hatcheries will provide fish for a few additional stockings to be made this fall, consisting of brook trout, Atlantic salmon, lake sturgeon and muskellunge. The lake sturgeon will come from the DNR’s cooperative hatchery in Tower that is operated with Michigan State University. The DNR welcomes visitors to its state fish hatcheries and interpretative centers to witness first-hand the fish-rearing process and to learn about Michigan’s remarkable waters. For more information, visit www.michigan.gov/hatcheries. The DNR maintains a public database of fish-stocking records which can be reviewed at www.michigandnr.com/fishstock.